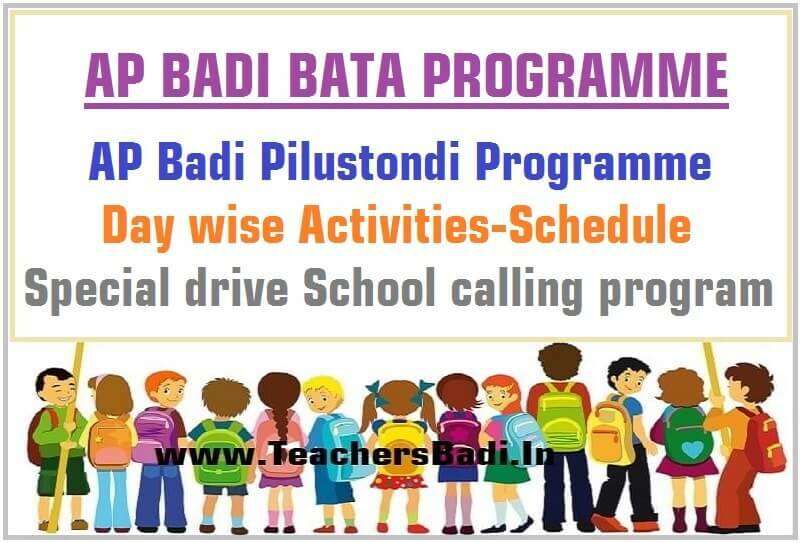 AP Badi Bata Programme,AP Badi Pilustondi Programme 2016-17,Day wise Activities/A Special Drive badi pilustondi programme 2016-17 day wise schedule/school Calling Programme in all AP Schools/ Malli Badiki Programme:Badi Utsavam, balika Utsavam,A day for Children with Special Needs, Vidya Sadassu, Student Day, A Day with Community. AP Badi Pilustondi Programme 2016-17 From June 15th to 21st, 2016: The Primary Objective of Right to Education Act, 2009 is to ensure enrolment of all children in the age group of 6-14 years in to the school. Inspite of best efforts it is unfortunate still some children remain out of the school. Such children can be divided into two categories i.e., Never Enrolled, Enrolled but dropped out. Some children are also involved in hazardous occupations and engaged as "child labour". Seasonal out migration and in migration of families has added to the problem of dropouts and many such children are discontinuing of Education. In effect, there is a dropout rate of 19.06% upto elementary level in the present Andhra Pradesh State. Govt. of Andhra Pradesh in its total commitment towards implementation of "RTE", has proposed for special drive with the following objectives. 7. To implement and monitor this programme, District level committee and state level committee are formed. 6. Children shall be provided with excellent quality mid-day-meal. Mid-day-meal shall be provided in adequate quantity as per norms. The objectives of “Badi Pilustondi” shall be achieved through community participation, parents’ involvement, effective teacher participation and also regular monitoring by the education department. The knowledge of NGOs, CBOs and Corporates will also be utilized in improving the infrastructure as well as quality of education. The resources under SSA and RMSA program shall be utilized fully and effectively and in a transparent manner. It is observed that though schools are provided grants under SSA and RMSA, many schools as on today do not have television facilities though number of lessons are being telecasted through MANA TV. Timely utilization of funds will ensure better grants from Govt. of India. Success lies in creating awareness among parents about importance of education and highlighting the benefits being provided by the Govt. to take this education to their door step. Awareness shall also be created about the mid-day-meal programme. It is established that many of the children are not utilizing the mid-day-meal as food is not tasty and not being served hot. The local community and School Management Committees should be made active in effective supervising of mid-day-meal benefit being availed by all the children. The involvement of all other departmental officers as a part of “Janmabhoomi-Maa vooru” is expected to motivate parents to send children to school, especially girl children. 3. All toilets sanctioned by the District Collector under RWS, SSA and RMSA shall be completed before 30.06.2016. 5. 100% grounding of works under Rastriya Madhyamika Siksha Abhiyan and Sarva Siksha Abhiyan shall be ensured. mid-day-meals. Atleast 10% increase shall be achieved. 7. 100% AADHAAR seeding of children shall be ensured so that there will be transparency in enrolment, teacher deployment and proper utilization of funds for free text books and uniforms etc. 8. Schools shall make effective utilization of school grants and maintenance grants released under SSA and RMSA. This will ensure clean premises, white washing of all schools, good ambiance and availability of Teaching Learning Equipment in every school. 9. The toilets shall be maintained in good condition. Govt. of A.P has sanctioned Rs.1,000/- per month to all Primary Schools where enrolment is more than 60, Rs.1,500/- per month to all Upper Primary where enrolment is more than 100 and Rs.2,500/- per month to all High Schools where enrolment is more than 150. These grants are being passed on to the schools and should be utilized effectively in maintaining toilets and drinking water source in good hygienic condition. 10. District action plan should be prepared in every district to cover all the infrastructure gaps under SSA and RMSA as per approved Annual Work Plan of Financial year 2016-17. Balance infrastructure gaps may be included in the Annual Work Plan for 2017-18. 11. Certain issues, which cannot be covered under SSA and RMSA shall be submitted to the State Government for sanction of funds. 12. Teacher performance should be closely monitored by the MEOs. DEOs, RJDSEs and the District Collectors. Those teachers, whose performance is excellent should be rewarded through meritorious certificates. 13. All adults who are illiterates should be enrolled under “Sakshara Bharath” programme and District Collectors should motivate them to attend examinations under National Open School system and also A.P Open School system and ensure that they are made literates within coming four years. It is proposed to be conduct of “Badi Pilustondi” in the State in connection with special drive for enrolment of all out of school children. The Badi Pilustondi programme will be commenced and following activities are planned for implementation. On this day the entire information of Out of School children will be released. All the facilities available in the district like hostels, Residential Schools, KGBV Schools, NRSTC etc., will be published for the benefit of Parents and Community at large. Thereafter, the identified Out of School Children will be formally joined in the School. Conduct of Grama Sabha in all the villages of the district under the chairmanship of Gram Sarpanch. The aim of Gramasabha is to motivate the parents to admit children back to school. Rallies of children & Teachers can be organized on this day. Folkdances, Kalajathas are to be conducted in all villages to cause wide publicity of this programme. MEOs, Dy.E.Os., Headmasters, DEOs, MPDOs & MROs should make night halt in most backward and problematic villages in the Mandal. KGBVs & Govt. Schools will be visited by Mandal level team. Girl children who are achieve, in spite of poverty, lack of facilities, should be honoured. On this day awareness programme will be conducted to all parents at "Bhavitha Center" and explain about concepts of inclusive education since It is observed that Children dropout because of Special problem like low vision, deaf & dumb, dyslexia etc. All SMCs will be invited to at mandal level for this Vidya Sadassu. All parents will be explained about facilities provided by govt. for good Education like i.e. Highly qualified teachers, Free text books, Two pairs of uniforms, Mid day meal, Good infrastructure in schools. The Office bearers will be provided with the list of out of School Children and are to be requested to involve in admission of out of school children in schools. The meeting will be presided by MPP & ZPTC will be the guest of honour. MEO will be convenor & conduct the workshop. Children are also to be motivated to continue studies at least up to 10th class. In every school teacher should explain about Right to Education (RTE) to children and take oath from children at least to complete 10th class without break. Elocution/Debate/Essay Writing competitions can be conducted to all children on the topic I will complete atleast 10th class & achieve higher goals. Certificates will be given to best performer in the competition, School grants can be used of this purpose. Certificate should also be specially given to children who motivate dropouts to join back to school (Child to Child motivation). All parents, teachers and children will eat Midday meals together in the schools and discuss about improving the quality. At the end of week, it should be ensured that all Out of School Children are enrolled in schools. Similarly, transition of children will be ensured from one class to next higher class to prevent drop-outs. The District Collector shall form team of Senior District Officers to follow up the programme and send daily report of enrolled children and other activities.